Blue: Not what I was expecting. You? Blue: Should we move on to the next one? White: I guess so. Who would have guessed auditioning male strippers would be so tedious? Blue: Maybe we should just get a magician for Hildy’s bachelorette. Pattern from Out of the Ashes. 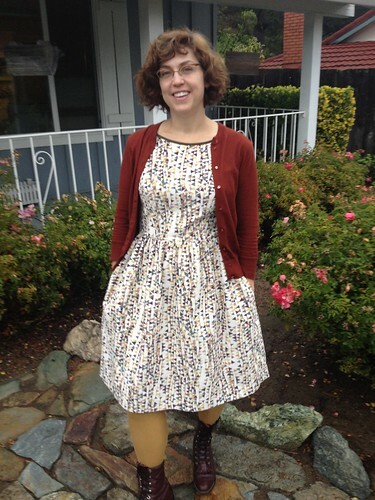 How do I try to make a cotton seersucker dress autumn-appropriate? By adding a cardigan, knee socks, and boots. The boots are an ancient pair from J. Crew that were probably the luckiest purchase I ever made at the big thrift store at Lawrence and Kedzie in Chicago. (They were FIVE DOLLARS! For those of you keeping thrift store score scores at home). It helps that the dress is all dark colors, anyway. “Seasonally-appropriate” for me seems to be way more about the colors and the fabric than the style of dress … I don’t subscribe to that fashion-mag article of faith that you can take some frothy pale-mint chiffon-y dress that couldn’t be more “Easter-tide” if you wore it with fuzzy pink bunny ears, and wear it in October as long as you put wooly tights under it and a slouchy gray cardigan over it. But that’s probably just because I’m a cranky old person. Please vacate my greensward, etc. etc. And oddly, I don’t mind earth-tones in the spring and summer, if they’re in summer weights and shapes; it’s just sundress-style pastels and primary colors in winter that tweak my irk-ometer. I’m hoping to get some sewing done over the Thanksgiving break: the plan is to make two or three more 9929s … but only ones suitable as party dresses. I have some shantung ready and waiting for colorblocking, some rainbow lamé (yes, rainbow lamé) and even (if I can find my safety goggles and a fume hood so I can cut into it) some Betabrands Disconium. Watch this space! So the Vogue 9929s are continuing into the autumn, despite their sleeveless nature. 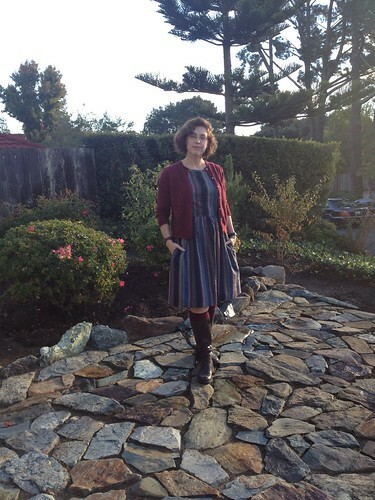 I used to think sleeveless dresses in wintertime were really weird … and then I moved to California, where I am sitting sans this cardigan at my desk right now, after a warmish 30-minute bike ride into the office. Liberty babycord is super, super soft but still hangs nicely. And the pile/wales of this corduroy are not so deep that you have to use a needleboard when pressing (which is good since I have no idea where mine is). I didn’t want to do self-fabric binding at the neck, because I thought the corduroy, as fine as it is, would still be too bulky, so it’s plain old Wrights bias tape, in olive green. The flags in this pattern are a purple-y mauve, marron, tan, pumpkin, and mustard, and a kind of smokey teal green (or greenish gray). I’m also wearing an olive-drab Swatch, which you can’t see because my hands are shoved deep into my pockets, as always.